Last weekend was a weekend of speed. Seriously! My parents were in Salt Lake City for a conference so I decided to try to hop on a plane and make it out to visit them and my brother, Robert (he lives in SLC). Friday night, I went to a fun party with Robert (actually the pre-party to a huge party PARTY called the Courtney Cup). It was loads of fun hanging out with Robs friends. I stayed with him and his roommates all night. One of his roommates also had family in town, so I was up until the wee hours of the morning laughing and talking. Ahhh to be young and in college again. Saturday morning, a group of us went for breakfast to a classicly classy place you might've heard of... IHOP. LOL! We had loads of fun people watching and sharing various stories about each other. Afterwards, it was HAIR TIME! Wahooo! Of course, when my Texas friends learned I was going to have my hair done in Salt Lake City, they thought I was nuts. They just don't know Darren. Darren is a hair master! Seriously! He masterfully gave me some extra fabulous highlights and then used his scissors to add texture and dimension to my otherwise bland and boring hair. I SO love my cut and color. I'll fly to SLC to have my hair done by him ANYTIME! After hairtime, Robert and I met up with my parents at the Olympic Fountain at the Gateway Mall in Salt Lake for dinner. We celebrated my father's birthday with tasty food! We had the waitress take a photo of us, but didn't go back and double check the photo. So, this is the only photo we have ... boo hoo! After dinner, we drove around for a bit (my parents love to drive around ... and around... and around with no where to go. Seriously!) and then we said goodbye to Rob. I went with my parents to visit and stay the night with my Aunt Carolyn, Uncle Ernest and their family. Aunt Carolyn is my most favorite Aunt. I know I shouldn't have a favorite - but I can't help it. She was my babysitter long before she was my aunt (in Illinois before we moved to Germany). She helped me get my first US Drivers License. She also put up with me waving to her neighbors (she is REALLY shy) and doing other silly obnoxious things as only an outgoung social butterfly of a niece can do. I was also sure to harass and bug my Uncle Ernest. Ladies and Gentleman, THIS is your Weber County Surveyor! Seriously! He really is one HECK of an awesome uncle. He knows how to do all kinds of handy things, and is always ready and willing to lend a hand when needed. I spent quite a few weekends back when I was attending college at his house. He's really is one awesome guy! My Aunt Kathleen traveled to SLC with my parents to visit too. Though we didn't get to talk or visit mugh, it was also good to see her for a bit. After lots of chatting and hanging out we all went to bed. It was only a few hours later on Sunday morning when Mom and Dad dropped me off at the airport. Shortly I was on a flight back to Dallas. Speedy trips ... they're fun but boy are they exhausting! Mix sugar, syrup, water & salt. Bring to a boil over medium heat. Stir, cover, and cook for 1 minute. Remove cover and cook to soft ball stage. Add 1/3 C. of mixture to the egg whites. Continue cooking the remainder of the sugar mixture until it reaches hard ball stage. Add to egg white mixture. Beat until fluffy and add vanilla. Beat until it loses its gloss. (You'll probably have to hand beat it for the last few minutes). Add nuts (if desired). Drop by the teaspoon full onto wax paper and cool. ** This recipe is from Aunt Carolyn's recipe stash. Boil all ingredients together. Pour over 4 quarts of popcorn. Mix all ingredients together and roll into 1" balls. Put onto a greased cookie sheet. Bake at 350 for 6-7 minutes. ** This recipe is from Aunt Carolyns Recipe Stash. In a large bowl, cream the 3/4 C. sugar and butter. Beat in egg and vanilla. In a seperate small bow, stir together flour, salt, baking soda and cream of tartar. Stir into butter mixture until well blended. In a third bowl, mix the remaining sugar and cinnamon together. Grease 2 cookie sheets with shortening. Shape dough into 1" balls and roll each in sugar/cinnamon mixture. Place balls 2" apart on cookie sheets. Bake 8-10 minutes. This recipe is from my Aunt Carolyn's recipe file. Your hair: ... is getting done this weekend! Wahooo! Your dream last night: I don't remember. Your favorite drink: It should be ice water with lots of ice, but in honesty it's a Route 44 Diet Coke with extra, extra ice from Sonic. Your dream car: I really don't have one. I like the CR-V I drive now very much. The room you are in now: My creative studio. Your fear: not having family - being alone. Where you want to be in 10 yrs: Still in happily in love, a Mom, on the right track spiritually, happy. Who you hung out with last night: Myself? Steve left for work at 9:30pm. Wish list items: Big: A weekend getaway with Doug, a new laptop, a new monitor, a new digi SLR camera. Small: a Macintosh Apple candle, diamondique earrings, an organized studio. Last thing you did: Sonic Run... see above. What are you wearing: yoga pants and a white Tshirt. Favorite weather: Spring and fall mornings when it's crisp and cool outside - perfect for a run or brisk walk. Last thing you ate: Rold Gold Honey Wheat Pretzels - Deb got me hooked on them at CHA. They're awesome! Your life: is not what I expected it to be, but more than I had ever hoped for. Your best friend: Steve, my mother, Heather B.... I have many very good friends. What are you thinking about right now: What to pack for my trip? I really should get it done. Your car: Needs a good wash, wax, and serious detailing. Relationship status: Ooo-la-la, in love and married to my Mr. Right! Last time you laughed: Several times today at work! please send me your mailing information (i.e. address)! Really, the girls over at SCS are fantastic - and quite welcoming too! I'm a huge stamping fan - it's really no suprise to those of you who know me well. I started stamping when I was living in Wiesbaden. There were two ladies at church who were serious stampers. In all honesty, I thought they were beyond strange - they loved their stamps with such fervor and intensity. It was hilarious to me, a young girl at the time that someone could be so passionate about a crafty hobby. Well, in reality the joke was, and remains to be, on me. In fact, it was stamping that led me into scrapbooking and soon led me into the world of designing and working with manufacturers. Recently, I discovered a stamping company that has really tickled my fancy - Papertrey or PAPERTREYink. I placed my first order a few weeks before CHA and didn't have time to play with them until I got home. Admittedly, I was worried because the quality of acrylic stamps can vary from manufacturer to manufacturer. My worries were completely unfounded. Papertrey stamps are high quality clear acrylic stamps. They come in the best storage tin ever (in my not-so-humble at times opinion) - a clear CD case. This tickled me because that's my current storage method of choice for the majority of my unmounted stamps. (I still use my S-Purse for specific stamps like Technique Tuesday shapes, Autumn Leaves, and the infamous $1 stamps you can find at Michaels and JoAnns.). Anyway, each month on the 15th, they release a new collection of stamps. Boy are they fabulous. I can't wait to place my order! They also started to carry both Maya Road Velvet Blossoms and Blossom Sheers. They're great additions to the line of products they carry. I really love what they've done in their gallery with samples! Anyway, an online community I started to recently lurk on (Splitcoaststampers.com) is holding a pre-launch party/thread and are chatting about the releases and generally just getting excited about the new stuff. So, to join in their excitement, I figure I can send out at least a few sample packages of Maya Road Blossom Sheers and Velvet Flowers - I mean, it's the least I can do as a MR Design Team member, right? So, post your name and where you're from. Tommorrow morning before I leave for work, I'll post a winner to my little contribution to the excitement. This weekend we had Donna Downey visiting us over at The Scrapbook Pad (have I told you often enough how this is my favorite job??). Talk about CRAZY crops! I love being the store's Event's Coordinator and sometimes Crop Hostess (I'll be back on a regular store schedule in September). This wekeend, I was more than a little ... um .... in rare form both nights. Seriously. 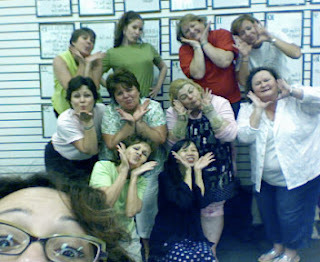 Here are a few photos from Donna's blog. Yes, that's me - and of course my partner in papercrafting crime (though she's digital now), assisting me with my surfing skills. 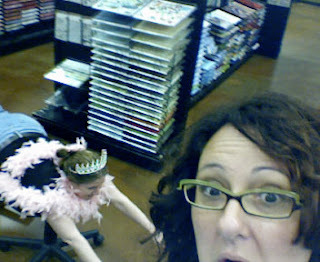 Yes I'm in a pink feather boa, and yes I am most certainly wearing a 'drag queen worthy' tiara. 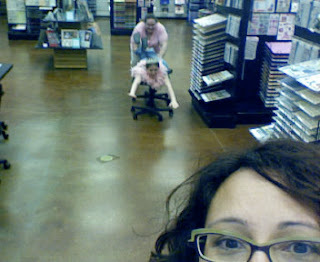 BUT, it was all for promoting Scrap Pink! Seriously! Yes, I almost surfed right into Donna. Yikes! Honestly, I am a dork. We were all supposed to be doing our "Elsie" poses... um... do you think we achieved it? Seriously. What on earth was I thinking? Seriously. I feel like my 'to do' list is overwhelming at times - is yours? Sometimes, my list is all in my mind, and my mind is going a million miles a minute with different thoughts crossing each other like roads on a map. Great stuff, especially the micro chips and felts and the sheer albums!! Can't wait to see IRL. Ladies, send me your mailing information and I'll get a little love package out to you this coming weekend. ILately, my thoughts have really been focused on what is really important in life. While I admit that my artistic passions are incredibly important, my family and relationship with my husband outweight it at least three fold. They are incredible - all of them in their own individual and fabulously special ways. I'm absolutely blessed to have them all as part of my life. We're almost ready for the "real" repair work to get started on the house. Oh my. Seriously, if I could do everything I wanted to this house I'd be in hog heaven. Reality is though, it's going to take time, and we're going to have to do it wisely. We're paying for all of the repairs and changes ourselves. While it would be so fabulous to have it all done right NOW (and believe you me, I have my days - more often than not - where I want it done yesterday), I have to be patient, and let everything run it's course. So much will be done to our home when it's finished, that it won't look like it's original (when we bought it) state. I think I'm most looking forward to the tile floors throughout the entire first level. Can you imagine how great it will be to not worry about dust and stuff in the carpet. Oh, what heaven I hope I'll be in. Since nothing is going to be happening repair wise in my studio, I've tried to focus on being in there, going through my stashes and moving boxes, and just generally getting everything organized or situated. Man, I have a LOT of crafting stuff. Seriously - it's almost (Note I did say ALMOST) ridiculous. Of course, since I do love it all so, it's not. But, it could one day be. One of these days I'll have a big crafting garage sale and clear out the products and items that are stifling my creativity. Do you ever feel stifled by the sheer amount of "stuff" you have? Please tell me I'm not alone. I'm also really focusing on eating better, not only me but for Steve too. We need to work on making sure our bodies are getting the right nutrients and the right vitamins the natural way and not through supplements or unnatural sources. Don't get me wrong, I'm a firm believer in supplements - they've helped me immensely over the years. However, they have become my sole main source of vitamin intake - not a good thing. Of course, it is my fervant hope that by following a more stringent and healthy eating plan that we can get and keep our bodies in tip top shape and avoid the health issues that genetically we gravitate toward (cancer, etc) or the issues which appear to become more prevelant in our society today (cancer, obesity, heart disease, etc). Alright, I'm rambling so I'll stop. Wow.. this is really a deep post compared to my normal light and fruity posts. Hmmm maybe that means something subliminally. I haven't forgotten about selecting winners for the Maya Road drawing. It's going to take me a bit longer than I had originally anticipated though. So much going on here. My apologies, but I promise to get to it soon! Recently, with so much on my mind and heart lately I've come to realize that each day is really a blessing and in most cases you get what you put into it. As the saying goes "Attitude determines Altitude". I'm working to keep that in my mind when I get frustrated at circumstances, habits, changes, and anything else which may not be going my way. Today really IS a great day - it's a brand new day and I'm free to choose how my attitude will be and how I react to things. I am going to make today (and everyday) a great day!